” Pilgrims Way, Wicklow Gap ” is one of a series of paintings born out of Rod Coyne’s love for the Wicklow mountains and their long history. This national park currently falls under the mantle of Ireland’s Ancient East. This original artwork is oil on canvas and measures 100 x 120 cm. (40″ x 48″ inches). The price includes FREE WORLD WIDE delivery. (Use the watermarked image to view the canvas in ultra, high detail). ” Pilgrims Way, Wicklow Gap ” is also available as canvas print. 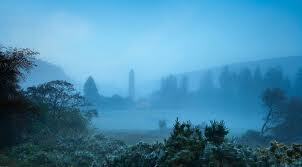 The Pilgrims Way leads to a misty monastery in Glendalough. A view from above Glendalough – the Pilgrims destination. “Back in the studio I managed to straighten out the random mark-making and it looked pretty much as it had on the mountain top. The real irony being that I next attacked the picture with quantities of thinners and allowed the various fields of color bleed into each in my own contrived random manner. The result is the artwork you see here today. I love it for two reasons; firstly, it perfectly communicates the winter landscape I saw before me that day. And secondly, it always reminds me of my own pilgrimage from blank canvas to perfect atmospheric painting” – Rod Coyne. ” Pilgrims Way, Wicklow Gap ” is January in the Wicklow on Canvas 2018 Calendar.